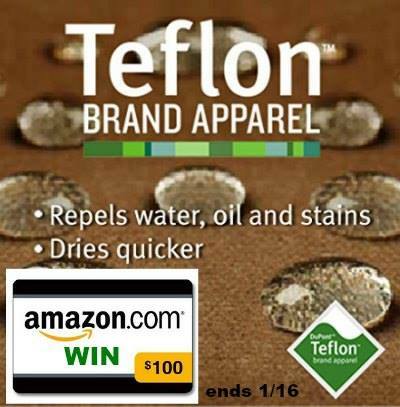 Just in case you guys want to check out all the styles and options of Teflon Brand Apparel, we are giving away a $100 Amazon Gift Card thanks to Teflon Brand! My husband would get the most use out of the Teflon Men’s Duck Jacket with Contrast Corduroy Collar in Brown. Teflon Men’s Duck Jacket with Hooded Fleece Insert, is the one i really like. I love the zip front hoodie and a flannel shirt in any color xl looks good on a woman men love it! My husband can definitely use the duck jacket! Would definitely use the Art Pan 11″ Frying Pan. I really love the Teflon Men’s Duck Jacket with Hooded Fleece Insert for my husband. The Teflon Men’s Duck Jacket with Hooded Fleece Insert would be a perfect gift for my dad. The Teflon Men’s Pebble Weave Zip Front Hoodie with Sherpa Lining Jacket, Large, Navy would be my choice for him. My guy works out in the elements everyday..six days a week. I think the Teflon Men’s Apparel LS Brawny Plaid Flannel Shirt, X-Large, Grey Blue..but, hope it comes back in Large. I would get the flannel shirts. My husband works in a warehouse with no heat in the winter or air in the summer, so he could really use these! I would get the flannel shirts as my husband needs new ones! I think he would use the Teflon duck jacket. My husband would love the Teflon Men’s Pebble Weave Zip Front Hoodie with Sherpa Lining Jacket in navy. More than likely the Teflon Men’s Duck Jacket with Contrast Corduroy Collar, X-Large, Brown. But, he might chose differently. I think my hubby would like the Teflon Men’s Duck Jacket with Hooded Fleece Insert. Without a doubt the Teflon Men’s Duck Jacket and I love the plaid shirt! I think my husband would like the Teflon Men’s Apparel LS Brawny Plaid Flannel Shirt, Large, Navy Red. My husband really needs a new jacket! I think he would like the Teflon Men’s Duck Jacket with Hooded Fleece Inser! I would choose Farberware classic 17 piece pots and pans set. I can’t decide between the Teflon Men’s Duck Jacket with Hooded Fleece Insert, Large, Brown and the Teflon Men’s Pebble Weave Zip Front Hoodie with Sherpa Lining Jacket, Large, Navy ~ either would be great and just exactly what my Honey/Hubby NEEDS (plus he’d really like it so he would wear it! )~ and it would be perfect for all kinds of occasions / situations. The Teflon Men’s Duck Jacket with Hooded Fleece Insert, 3X-Large, Brown would get the most use in my home. I think my husband would love the Teflon Men’s Pebble Weave Zip Front Hoodie . My husband would love the Teflon men’s duck zip up! Nice and warm! My husband would love the Teflon Men’s Pebble Weave Zip Front Hoodie with Sherpa Lining Jacket, Large, Navy! He is a hood cleaner so gets super greasy and it’s really cold in the winter! I think my brother would really like the Teflon Men’s Duck Jacket with Hooded Fleece! I like the faberware milliuam set. It is pretty and practical. I think my hubby would like the duck jacket with the hood. I think I would like TeChef – Art Pan 11″ Frying Pan, Thanks! I would pick the navy Teflon Men’s Pebble weave zip front hoodie. It has a sherpa lining which would make it a warm jacket. This would be perfect for him since he has lost the weight. Teflon Men’s Duck Jacket with Hooded Fleece Insert, X-Large, Brown would be the one my husband would love to have. I would say Teflon Men’s Duck Jacket with Contrast Corduroy Collar in the color Brown. My hubby would get a lot of use out of Teflon Men’s Pebble Weave Zip Front Hoodie with Sherpa Lining Jacket. My hubby would get the most use out of the Teflon Men’s Pebble Weave Zip Front Hoodie with Sherpa Lining Jacket. my hubby would love one of the zip front hoodies..he wears these a lot. My husband would want the flannel plaid shirts. He loves them. Definitely the Pebble Weave Zip Front Hoodie with Sherpa Lining Jacket (the gray one). I would pick the Duck jacket w/contrast.. I think my man would like the Teflon Men’s Pebble Weave Zip Front Hoodie with Sherpa Lining Jacket. I would get him the pebble weave Sherpa lined navy blue jacket. Nice! hahah I’m getting tired of looking at his plaid stuff, I’d get him some plain things now. My son could really get use from the Teflon Men’s Apparel LS Brawny Plaid Flannel Shirt. I like the TeChef color pan. My hubby would love the pebble weave sweatshirt in blue! I’m not sure. I’m guessing probably a jacket. I saw a couple of nice ones. He would get the most use out of the Teflon Men’s Duck Jacket with Hooded Fleece Insert. I would have to be the Teflon Men’s Apparel LS Brawny Plaid Flannel Shirt. Love a man in flannel. We would use this for sure…eChef – Blooming Flower 11″ Frying Pan, with Teflon..thank you! My husband would really like the Teflon men’s pebble weave zip front hoodie with sherpa lining jacket. I think my husband would use the Men’s Pebble Weave Hoodie with Sherpa Lining Jacket a lot as he is very cold natured and the weather is getting bad in our area. My husband would like the Teflon Men’s Pebble Weave Zip Front Hoodie with Sherpa Lining Jacket. I think my husband would definitely get use out of the Teflon Men’s Pebble Weave Zip Front Hoodie with Sherpa Lining Jacket, Large, Navy. I think my husband and son would like the zip-front hoodies. They both work outdoors alot so this would be a comfortable layer of warmth. I really like the Teflon Men’s Pebble Weave Zip Front Hoodie with Sherpa Lining Jacket, X-Large, Grey. I am overweight, so I like to buy men’s hoodie’s instead of womens. It seems like they just fit me better! I like it to be somewhat loose. I love this! I think my dh would love Teflon Men’s Duck Jacket with Hooded Fleece Insert. I’d get more use out of the 11″ art pan. I think my husband would like the Teflon Men’s Duck Jacket with Contrast Corduroy Collar, X-Large, Brown. Love the Men’s Pebble Weave zip front hoodie! My son in law would love wearing this on chilly days… Teflon Men’s Pebble Weave Zip Front Hoodie with Sherpa Lining Jacket, Large, Navy. Men’s duck jacket with hood, great all around jacket for fishing or hauling in wood. My fiance would use the Teflon Men’s Pebble Weave Zip Front Hoodie with Sherpa Lining Jacket a lot. I could use the Teflon Men’s Duck Jacket with Hooded Fleece Insert. Up here in Maine you need warm clothes, lol. I think the men’s Charles River 9149 Thermal Bonded Sherpa Sweatshirt. I like the half zip men”s cotton pullover sweatshirt for my husband. It looks really nice and has great reviews. I like that it has the Teflon name, and actually is repellent for stains and liquids! My husband NEEDS this!…LOL! He would get the most use out of the Men’s Pebble Weave Zip Front Hoodie in Navy (and I would borrow it sometimes too). Teflon Men’s Pebble Weave Zip Front Hoodie with Sherpa Lining Jacket, my husband would wear it for work. My husband and son would love the Pebble Weave Zip Front Hoodie! He’d either love the hoodie of the wok/stir fry pan. I think the Teflon Men’s Pebble Weave zip front hoodie with sherpa lining. I think my fiancé would get a good use out of the Teflon Men’s Duck Jacket with Hooded Fleece Insert. It’s been a little chilly in CA lately. My honey would love, and could use, the Teflon Men’s Duck Jacket with Hooded Fleece Insert. And it just so happens to come in his size, which isn’t always easy to find. I would love the Teflon Men’s Pebble Weave Zip Front Hoodie with Sherpa Lining Jacket, Navy. I need a new lighter weight jacket and this would be perfect. I could definitely see my boyfriend wearing the Teflon Men’s Duck Jacket with Hooded Fleece Insert. He already does that WITHOUT the insert. It would probably make it easier to use and manage with the hoodie as an insert. Teflon Men’s Pebble Weave Zip Front Hoodie with Sherpa Lining Jacket. The Farberware Classic 17-Piece Cookware Set would be awesome for my hubby and I! We desperately need new pots and pans! My husband would get the most use out of the Teflon Men’s Pebble Weave Zip Front Hoodie with Sherpa Lining Jacket. The Teflon Men’s Pebble Weave Zip Front Hoodie with Sherpa Lining Jacket would be my husband’s favorite … and my favorite to “borrow” from him! My hubby could definitely use the brown 3XL duck jacket with fleece insert/hoodie. I have a hard time finding nice, warm, durable coats for him that are big enough. He’s just under 6’4″, 260lbs with broad shoulders and long arms so it’s tricky! I think the Teflon Men’s Duck Jacket with Hooded Fleece Insert would be a great buy. And with the temperatures we have had so far this year, it would be used often. I know we would use the TeChef – Color Pan 12″ Frying Pan a lot. The flannel shirts always wear well on our ranch. Working horses or cutting wood the zip up hoodies are great too. I think the Teflon Men’s Apparel LS Brawny Plaid Flannel Shirt, X-Large, Grey Blue would look great on my hubby! My dad would love the teflon Men’s duck jacket! I would so love this, Amazon has some great apparel and other fit/health items and with job cuts I could use this!